Africa: Why Is Africa Always Portrayed As a Passive Woman? Exhibits from Michael Soi’s “China Loves Africa” exhibition at the Circle Art Gallery in Nairobi. At the start of this month, leaders of forty African countries went to Beijing to meet with the Chinese government. This massive forum happens every three years, alternating between an African city and Beijing. And every three years, without fail and with increasing intensity, the gathering launches a thousand think pieces on what China's increasing involvement in Africa means for Africa and other countries with interests in the region. I've always been fascinated by the epiphenomena of multilateralism - the secondary effects of these big meetings on how we think and talk about our societies. If you strip the international conference down to its bare bones, you realise how much of it is just pageantry. Most of the agreements that are announced have been negotiated in advance by bureaucrats at embassies and ministries. Summit conversations are often nothing more than repetition of talking points and jargon that has already been approved by the political class. The spaces where any real work gets done - the green room networking events and bilateral meetings - are hidden from media scrutiny. Yet, these forums have a lot to say about power dynamics between individuals and organisations. Who shows up? Who gets to speak? Who gives a press conference? The answers to these questions are often coded messages about who actually wields power. I love looking at the official photograph and noticing things. Like the fact that no women feature in the official photograph of this year's China Africa summit. I'm amused by the cultural production that accompanies these large-scale meetings and what they say about how power sees itself and how ordinary people view power. One thing that strikes me in the conversations around this current summit is the fact that people still see Africa as a raw material to be consumed rather than a place where people live. In the think pieces about how the US and Europe should respond to China, or whether or not Chinese economic engagement with Africa is good for Africa, there's a tacit agreement that the most important thing that Africa has to offer the world is stuff: raw materials for processing and consumption elsewhere. For the West, China is either a threat to "our ownership" of Africa, or is simply seen as providing a new way to consume Africa. The argument over whether China's involvement is good or bad for the continent seems heated, but fundamentally, both positions are centred on Africa's things and not people. Africa is valuable only as an opportunity for other places. This is the language of colonisation, and it is remarkable how even those who resist it routinely and uncritically employ it. 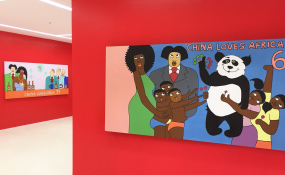 In the lead up to the summit, noted Kenyan painter Michael Soi launched a collection called "China-Africa 2018" at the Circle Art Gallery in Nairobi. The collection is basically various allegories of China's relationship with Africa: Africa as a woman being groped by China while Western countries - also male - watch despondently. Africa as a black woman lying on a massage table while China as a man fondles her bottom and half-naked white men representing Europe and the US watch with sadness. Around the same time, popular cartoonist Gado published a controversial cartoon in which a black limousine is surrounded by scantily clad women clamouring for the supposedly wealthy occupant's attention. The women are various African countries and the occupant is China. The only images I can think of where the EU has been painted as a woman are ones in which the far right was arguing that the arrival of Muslim migrants and refugees is a form of sexual assault against Europe. What does it mean that Africa is the only region in the world that is routinely painted as a woman? And that womanhood is equated to victimhood? Women's bodies as an allegory for passivity or as a commodity to be consumed by greedy, lascivious men - the whole idea is deeply disturbing. It's too easy for even people who know better to describe Africa in relation to its position in Western and now Eastern commodity chains, to accept that the challenge is in finding a suitor rather than emphasising the agency of African people. We pick up the discourse uncritically and in so doing reinforce it. Africa represents "a new economic frontier" and not, for example, a home. "What's Trump's position on Africa?" we scramble to answer as if Africa cannot exist without Trump expressing an opinion on it. Yes, it's in the nature of international economic and political discourse to unsee people, but shouldn't we resist this dehumanising language? There's certainly truth in that African political leaders are so eager to drop everything and traipse around the world, begging bowls in hand, at the beck and call of leaders from other parts of the world. In 2014, rather than visit various African countries, for example, Obama simply summoned them all for a meeting in Washington DC. And they came. Tony Blair did the same thing in 2004. Our presidents scurry off to Brussels and Paris, and China every three years.